This is the not the best selection of European Stone-Curlew images but I thought the birds’ behaviour sufficiently unusual to post them and see if anyone can shed light on it. 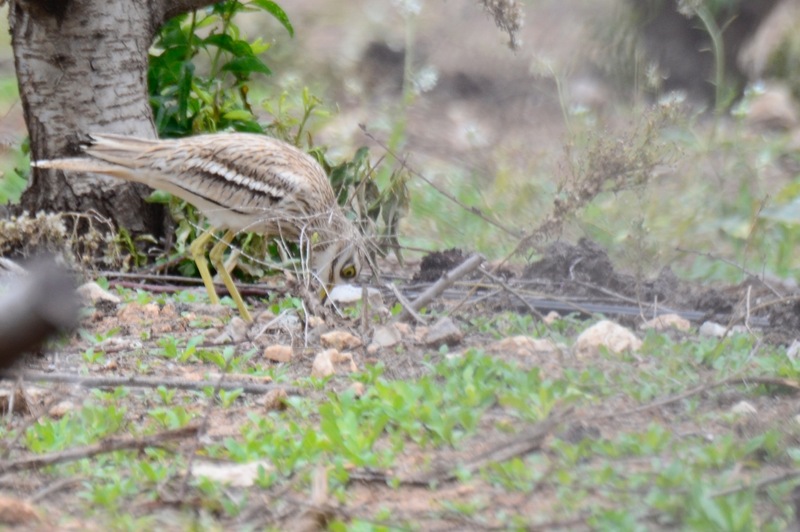 We were driving alongside a peach grove on the Judaean Plain in central Israel when two stone-curlews suddenly appeared walking away from the vehicle. One of the birds then trotted back through the trees to a spot just by a peach stump and genuflected its thick knees and I immediately assumed it was a nest, where she may well resume brooding. Instead of that, however, she stabbed down (as I now know to puncture the egg; see above) and resumed an upright posture with the egg fixed in her bill tip, holding it only by its lower end. It was an oddly plain and pale egg for this species with patterning concentrated at the top end, but of a size and colour to match stone-curlew. Pandemonium broke out in our car as we tried to get images. 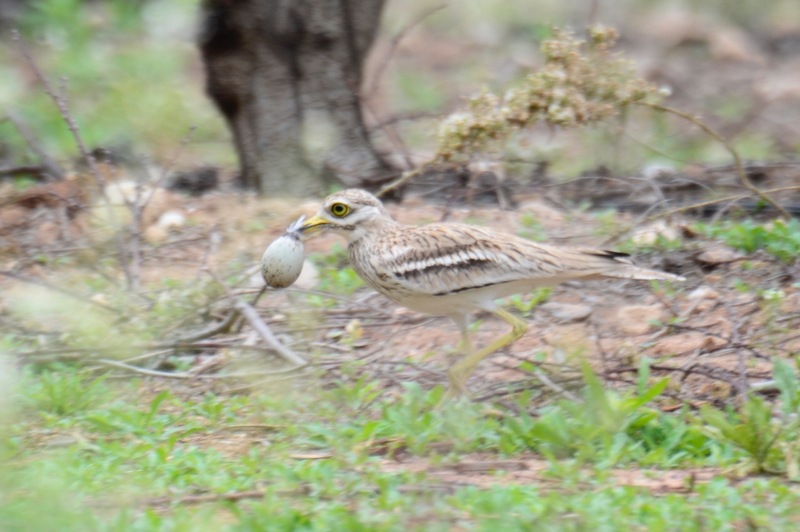 We left the birds one behind the other with what was assumed to be the female standing over a punctured stone-curlew egg. But what was happening here? Had we disturbed them close to a recently laid egg and she had therefore destroyed her own egg? Apparently stone-curlews are highly site faithful and return year in, year out to the same spot. 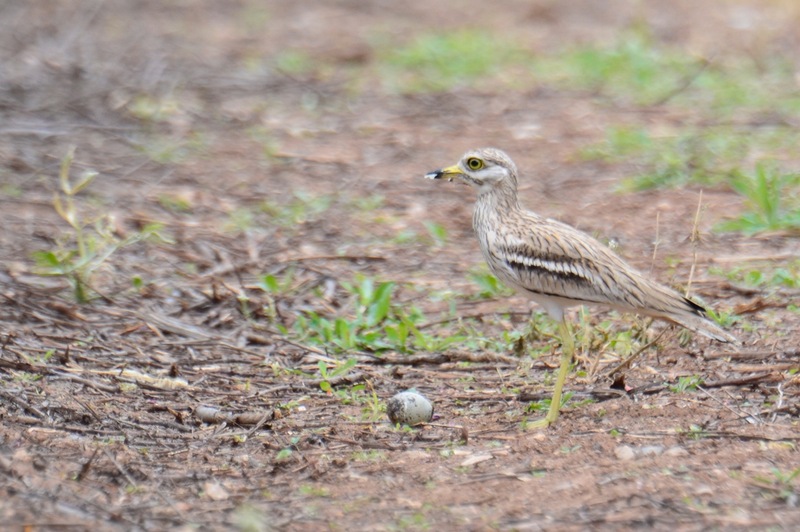 It seems unlikely that another stone-curlew pair had laid in their territory and she was destroying the nest of usurpers. But some nests do contain eggs from multiple females. Was it therefore an old egg in the old nest that she was simply getting rid of in preparation for a re-nest? They apparently lay in April. A single egg is the common clutch size but we didn’t want to go and see if there were other eggs in the nest. There was little sense that this was an old addled egg. The white ran clear when it dribbled out the crack. Apologies that the images are not brilliant and the information is sketchy but if anyone can shed any light I would be fascinated to hear.